Dr. Blackgaard's quest to steal Applesauce reaches its peak as he and crony Richard Maxwell take control of the computer at Whit's End. Evil has a name. And it goes by Dr. Regis Blackgaard. He and Philip Glossman have big plans that could put Whit's End out of business. And it looks like the bad guys are winning Eventually, right overcomes might while kids ages 8 and up learn about making smart choices and having integrity. Adventures in Odyssey is exciting, values-based audio entertainment for the whole family--brought to life by actors who make you feel like part of the experience. Adventures in Odyssey Episode Reminder Get a sneak-peek into each new show plus daily featured articles, delivered straight to your inbox! Part Saturday morning cartoon…part radio drama…and all designed to help your family grow in faith! 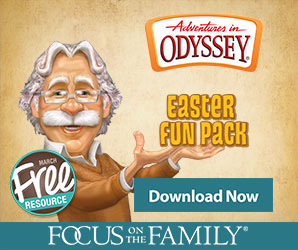 Adventures in Odyssey combines the characters kids love with the faith lessons parents appreciate. Produced by Focus on the Family. No matter who you are, what you’re going through or what challenges your family may be facing, we’re here to help. With practical resources — like our 1-800 Family Help line, counseling and websites — we’re committed to providing trustworthy, biblical guidance and support.